Hi guys I'm enjoying the dumaos when I can access it, thank you. Here's my issue, I seem to have access for a few seconds after i reboot to make changes then i loose contact with the router interface. The internet is online and still running on all devices. I've tried clearing cache and browser history. I've tried using other browsers and other devices. I've successfully downgraded to original R1 firmware and have done several factory resets. I didn't have trouble with the old firmware until i did this upgrade. Hi Ben - which version are you on now? The original R1 firmware or the new DumaOS? i've tried many browsers in incognito but I'm sticking with google chrome at the moment since you guys use this. I'm currently on dumaos. I have to set it up quickly before i loose contact. It feels like it times out and it takes a long time for R-apps to run. Any chance you can record your screen when this happens? Does it work if you use Firefox? I am using a Mac book pro. I'm using google chrome as my browser. I can't install firefox. Surely other people are using dumaos fine on google chrome browser or safari? Hi Ben - yes they are all fine. Could you try reinstalling the firmware again please - no need to downgrade. 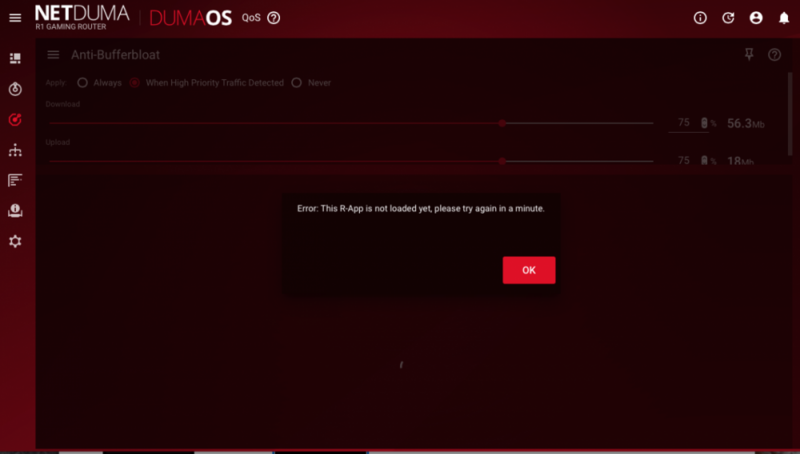 Just try installing the same firmware again within DumaOS. Do you mean install the dumaos again while still on dumaos? That's correct. But if you would prefer to stay on the R1 original firmware, please stay on that. Thanks Ben - noted! Let us know of anything you would like to see. Here’s and update: The problem isn’t fixed but i’ve found why it’s happening. I have a Diskstation from synology a nas drive that won’t let me access the router pages on dumaOS. When I turn the Diskstation off, I can then access the dumaOS. Upnp is working fine all though it does sound like a port conflict. Maybe they’re trying to use the same protocol at the same time like ssh or telnet. Either way I can’t use my nas drive with your router. I’m about to give up on this router as it’s too much hard work to just getting it to work. It sounds like they have the same IP address. 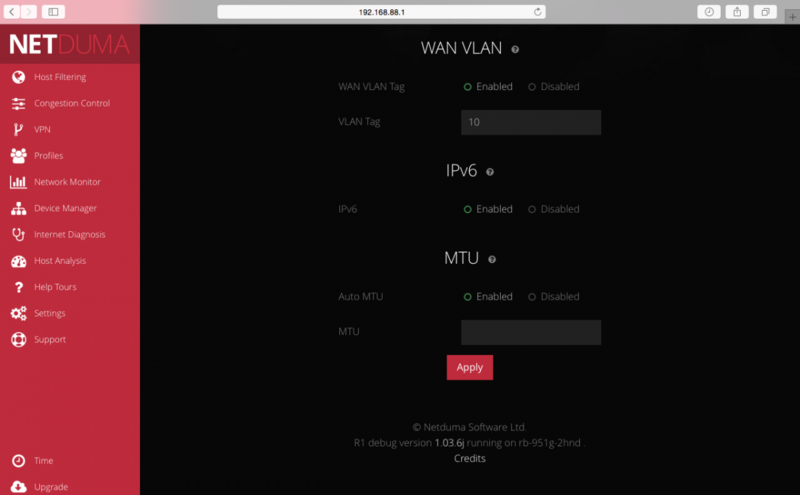 Change the R1 LAN IP to something else, does that resolve the issue and let you use both at the same time?